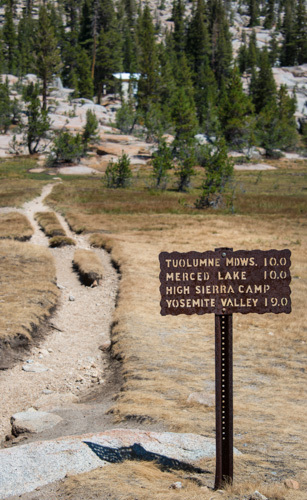 Browse: Home » Are There Too Many People on the John Muir Trail? Another opportunity to walk a couple hundred (~360) miles and see almost no one is the Bigfoot Trail. I’ve heard great things about this. Is it complete? Thanks Michael. Commendable assessment, Ray, especially that the hike is still well worth the effort. Being from the east, I hear a lot about congestion on the Appalachian Trail and have experienced it. The AT is far longer than the JMT, but overcrowding is now a problem at many places along the AT corridor. AT Conservancy is laying the groundwork, i.e. monitoring, registering hikers, etc. to eventually initiate a policy and program to address the mushrooming use of the AT. Thanks for the info and the comment, Mike! As usual Ray an especially timely topic, for me. My experience with the JMT has been like yours, about the same population density. Except that I have been passed on the Guitar switchers. My response, however is a variation on the theme. I think there is a middle way, or I should say a variety of middle ways, between the JMT and the SHR. This summer I will set out to put my boots where my belief is, leaving Glacier Point July 21emerging somewhere around Whitney 3 0r 4 weeks later, not stepping on the JMT for its first 90+ miles, and only about 40 of it overall, crossing all the same watersheds – except Lyle and Rush – and adding 4 or 5 more, including two east of the Crest. None of the smae northern passes and only 3 of the southern. I won’t camp within a mile of the JMT, but I will never hike more than a few miles from it. Still hit Red’s, VVR, OV maybe tag Whitney, and see folks in Lone Pine, and of course on that 40 miles. On and off the JMT, mostly off, but never on the SHR and not the TST. There are dozens, possibly hundreds of such variations possible on there. This one is my (first) John Muir Route. Sounds like your start is going to be like mine a couple of years ago (over Isberg?). I had a great time, and went more than 72 hours seeing no one. Good luck, Peter! Yep, Isberg. 70 Miles to Red’s. I think I’ll keep track of solo time: 72 hours is something to shoot for! Could happen . . .
Got it, Peter. For those interested, more here about this 70 miles: http://jmtbook.com/the-isberg-alternative/. Other hikers are to be expected on a route as glorious as the JMT. My experience has been crowds seem less when hiking southbound, as you are flowing with the majority of the hikers. When hiking northbound, you meet an endless supply of hikers. To minimize contact or negative interactions, simply choose to camp in less popular locations. Even at the often congested Rae Lakes basin it is easy to camp where few others camp and experience solitude. I like to leave early in the morning, which all but guarantees serenity. As you know, this is a great strategy for the Guitar Lake to Trail Junction section, as I find that to be a lonely stretch in the wee hours. So, simply and slightly alter how you hike the JMT and you will find the wilderness experience you are seeking. No JMT this year for me — I am hiking the Green Tunnel of Oregon from California to Washington. Less vertical, lower elevations, easier hiking, and close to my Bend, Oregon home. Sounds wonderful, Ken. Good luck this summer and thanks for the comment! The JMT was my first solo hike and the frequency of meeting people was a plus. I knew someone would come along soon if anything happened to me. I’d still be a bit hesitant to take a long trip on a less popular trail, such as the High Sierra Trail from Sequoia to Whitney. I feel the same way, Trinka, when I am hiking solo. After a while I like seeing some folks. Thanks! Speaking of the Whitney to Sequoia trail (to Crescent Meadow to be more precise), do you have any comments on this. Will resupply be an issue as I am planning to do the SOBO JMT to Whitney and then head to Crescent Meadow. Are there some good information sources for this leg? Thanks. Always enjoy your blog and book. Never been that route, Ovidiu. Sorry! THis is the High Sierra Trail, Whitney to Crescent. There is a ton of info out there if you look it up as such. And resupply is definitley an issue. NOthing available between WHitney and Crescent, and resup from WHitney into Lone Pine is not a good idea, maybe not even technically available. Whitney to CM is about 60 miles by the HST so dependiing on your pace, you will almost certainly need a resup , probably Kearsarge/Onion Valley/ Independence to conplete it. It has been done in 2 days from Whitney over Pants Pass, but that is very aggressive and would still likely need a resup at OV. What is your pace, and what is your las planned resup before Whitney? Thanks for the info, Peter. Important stuff. I passed an enormous number of people on one day in early September last year on the southern part of the JMT. So the next day I kept count as best I could and tallied over 150 people. That didn’t include those that were inside tents or down by the river, etc. And the previous day there were more; I’d guess in excess of 200. For me that was too much. Extrapolating, I estimated that there would be about 1000 people on the JMT. This is in line with what one backcountry ranger told me: that on a typical summer day last year about 100 people would walk past a given point on the trail. That’s more than I’ve experienced, but I wasn’t on there last year. You must have been really hauling! Those were 25 mile days but in the opposite direction from the predominant flow of JMT travelers. How far does an average backpacker walk in a day, maybe 12 miles? So I figured I was effectively passing 37 miles worth of backpackers, about 1/6 of the length of the JMT. Now I understand; 25 miles is much more than the typical 11 – 14 I do. Thanks! Very timely post, and I completely agree. Many times there are no easy answers. But, like you, I have spent most of my life being in charge of stuff, and while it is difficult to balance all the different aspects, there is definitely room for improvement. 1. The permit process itself is confusing, and antiquated. I myself, could code an online system within a week, that would solve all the problems, yet we see no improvement in this area, and many hikers say the most daunting aspect of the JMT is navigating the permit process. 2. One issue that comes with people, is impact. Unfortunately, human behavior is the most difficult thing to control. Some of the things I have seen are truly heartbreaking. Hikers washing dishes in a lake, not burying waste, improper food storage, etc. Although I have seen it in remote areas, as expected, it is much more of a problem in areas frequented by non-JMT hikers, and is the reason cited most often for limiting access (environmental impact). In my 8 years hiking the JMT, I have seen a ranger every year in remote areas. In the areas with the most impact, (Whitney, Cottonwood Pass/Lakes and HI to Donahue) I have never seen a ranger on the trail. I’m sure they are there, but the ratio of ranger to people with easy access in high impact areas needs improvement. Yes, I know budgets keep getting cut, but I think an increase in park fees / permit fees (for all overnight stays, not just JMT) would help mitigate this. 3. Clearer separation of JMT and non-JMT from both Yosemite and Whitney permit systems. As it is now, it’s a little murky and convoluted, and encourages people to try to game the system. The issue of permits being balanced between thru hikers, and non-thru hikers is a valid one, and it wouldn’t be that difficult to completely separate the two systems to create more balance, to ensure minimum impact, while allowing both JMT and non-JMT hikers to enjoy the area. Thanks for the thoughtful response, Kathy. Can’t disagree with any of it. Ray – I hiked solo SOBO, from T.M. Aug 28 to Kearsarge/OV by Oct 5th. I had at least one 24 hour period of not seeing anyone, and another day of rarely seeing people. I frequently camped where there were no people. Hiking later in the season definitely make for a quieter trip. I enjoyed meeting the people that passed me going South, and the NOBOs too, but I got used to camping alone. I am sure that June/July and the trails HI to T.M. and the Whitney Zone are a totally different experience. I agree with you that they are doing the best that they can while still allowing people access to this beautiful trail. Thanks for the comment, Linda. Ken: if you’re doing Oregon, I highly recommend reading “Cascade Summer” about just that stretch. And it isn’t a green tunnel the whole way. Enjoy!